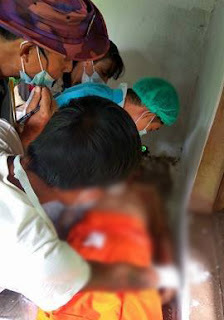 A Buddhist abbot was killed by an unknown culprit or culprits on Wednesday in the southern Shan State township of Mong Nai, according to local sources. Venerable Sao Kaelasa, the head of Wat Oot temple in Mong Nai, was reportedly on his way by motorbike to pick up a Buddhist novice in the village of Wan Loi at about 5pm when he was attacked and left for dead at the roadside. His motorbike was taken. “U Sao Kaelasa went to look for the novice monk as it was getting dark. There where he was attacked.” said Sai Tun Hla, the head of an aid group in Mong Nai Township. “When the novice returned he found the abbot had been stabbed in the heart with a metal stick. He must have died at the scene of the crime. “The police and some villagers brought his body back to the temple for funeral rites,” he added. Police say they are investigating but at the moment there does not appear to be any motif of conflict or of a personal nature. Sao Kaelasa’s grieving mother said that some locals are speculating that he was killed by drug users because there are many addicts in the area. Some 90 percent of the Burmese population is Buddhist, and monks and abbots are highly respected across the society. They act as spiritual leaders within their communities and also perform important duties at weddings and funerals. “If this happened because of his karma, so be it,” said his mother.